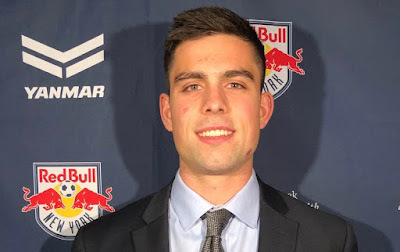 Brian White, the Red Bulls top pick. @NewYorkRedBulls. The Red Bulls made three selections in the first two rounds of the 2018 MLS SuperDraft on Friday afternoon at the Philadelphia Convention Center. With the 16th overall pick of the 2018 MLS SuperDraft, the Red Bulls selected Duke product Brian White, and in the second round, they selected Niko De Vera 31st overall and Tom Barlow 39th overall. Forward * 5-11 * 180 lbs. * Flemington, N.J.
White, a two-time All-ACC second-team choice, earned his first All-America Third Team honors after leading the Blue Devils in scoring with 10 goals and two assists for 22 points in 2017. A four-year standout at Duke, he played in all but one match (73 of 74) and started in 63 of 74 as a Blue Devil. The Flemington, New Jersey, native was top-five on the team in points at Duke, accruing 57 points on 23 goals and 11 assists. White and current New York Red Bulls midfielder Sean Davis were teammates during the 2014 season at Duke. White is also a familiar face with New York as he competed for the Premier Development League side this past Summer, scoring 17 goals along with three assists. The 5-foot-11 forward was named the PDL's MVP for his performances over the course of the 2017 season. Defender * 5-5 * 180 lbs. * Camas, Wash.
De Vera, a three-year letter winner at Akron and a Portland Timbers Academy product, had his best season during his senior campaign, earning All-MAC honors as a second-team honoree. The Camas, Washington, native started all 23 matches during his senior campaign and tallied four assists as a defender. Forward * 6-2 * 185 lbs. * St. Louis, Mo.